The notion that Trump's planned protectionist measures (tariffs and border adjustment tax) will be USD-positive is founded on an unrealistic world –where Mexico, China and other US trading partners would just sit back and watch without any retaliatory action. We're not in the 1980s or 1990s when US trading partners operated in a closed world, unaccountable to any world free trade bodies. Regarding the chart below: Yes, there were other factors driving the USD in the mid 1980s and early 2002 aside from protectionism. But US trade actions are no longer going unanswered. The most recent example was W Bush having to reverse the 2001 steel tariffs after the EU threatened to target Florida's orange juice and Detroit's autos. Imagine what the Chinese could do. 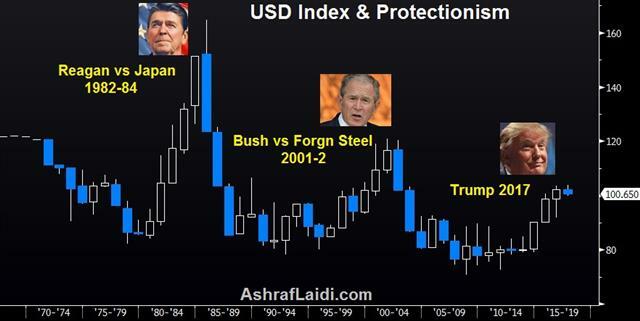 Historical reminder: Since the 1990s, currency traders have consistently sold off the US dollar at each occasion the US adopted protectionist measures (Reagan vs Japan in 83-84 and Bush Jr with foreign steel). Parallels with February 2002: It is no surprise that George W. Bush's war declaration on foreign steel in late 2001 aimed at saving the bankrupt Rust Belt in order to boost his Mid-Term election chances coincided with the peak of the USD bull market in February 2002. By the time the WTO fined the US $2 bn in sanctions, the US dollar had lost 12%, before falling into a 7-year bear market. Considering warnings about USD strength by Trump and Mnuchin, any mention of the USD impact on growth and inflation in next week's FOMC statement could cap the USD's rise and reignite speculation about the end of the strong USD policy.